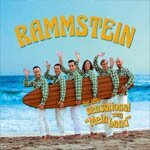 On 11 November 2011, the first single MEIN LAND from the Rammstein retrospective MADE IN GERMANY 1995-2011 is to be released in Germany, Austria and Switzerland. The international release date is 14. November 2011. The single will appear as a 4 track CD Digipak, as well as a 7? vinyl with 2 tracks. In addition to MEIN LAND, it includes the as yet unreleased song VERGISS UNS NICHT, as well as remixes by BossHoss and Mogwai. The video for MEIN LAND celebrates its premiere on 11 November 2011 at www.rammstein.com. The cover art was probably inspired by the Beach Boys album ”Surfer Girl”. The front cover of Surfer Girl features (from left to right), Dennis Wilson, David Marks, Carl Wilson, Mike Love and Brian Wilson holding a surfboard from the same 1962 photo shoot that produced the cover of their album debut Surfin’ Safari. The picture was taken by Capitol photographer Kenneth Veeder at Paradise Cove, north of Malibu. The cover art for "Mein Land" was probably inspired by the Beach Boys album “Surfer Girl”. The front cover of Surfer Girl features (from left to right), Dennis Wilson, David Marks, Carl Wilson, Mike Love and Brian Wilson holding a surfboard from the same 1962 photo shoot that produced the cover of their album debut Surfin’ Safari. The picture was taken by Capitol photographer Kenneth Veeder at Paradise Cove, north of Malibu.